I've been making a small set of dwarves for my 6-yr-old daughter. She's interested in playing with Hobbit miniatures, but I didn't want her using lead models. 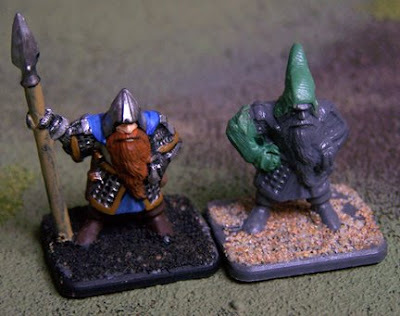 Grenadier Miniatures produced a three-pose range of plastic 28mm scale dwarfs. They are now sold by E-m4 miniatures. Although there are only two suitable poses for my version of Thorin's company, it's impressive how much variety one can create with a little putty and paint. Spears have been modified to be walking sticks, or removed to create lanterns, mugs, etc. Initially, I added putty to cover up the dwarves' chain mail, but I settled on simply painting over the armor. I think it kind of looks like knit cloth with pockets! These aren't the most sophisticated of conversions, but they're certainly suitable for the rough play of a little kid. To represent Bilbo we are using the plastic Frodo that came with GameWorkshop's Mines of Moria box. Opponents are the plastic goblins from the same box. 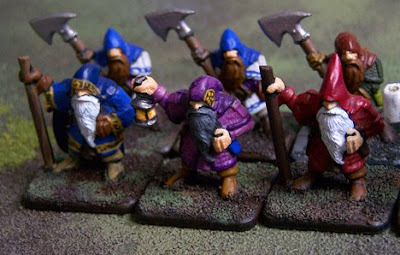 I have a soft spot for those old Grenadier dwarves. They stand up pretty well to the test of time, IMO. The conversions are excellent. It's true, a little greenstuff work and they look remarkably different from the basic pose. Thanks. Yes, I really love Grenadier old Fantasy Warriors range. Copplestone's and Lund's sculpts have held up well through the years. Their style doesn't look dated.